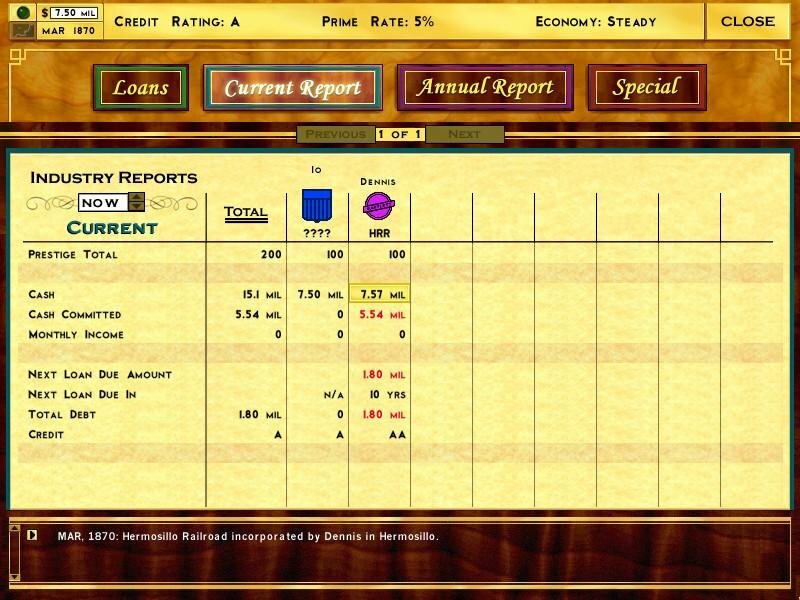 Low tech graphics underscore the thinking man’s railroad builder. 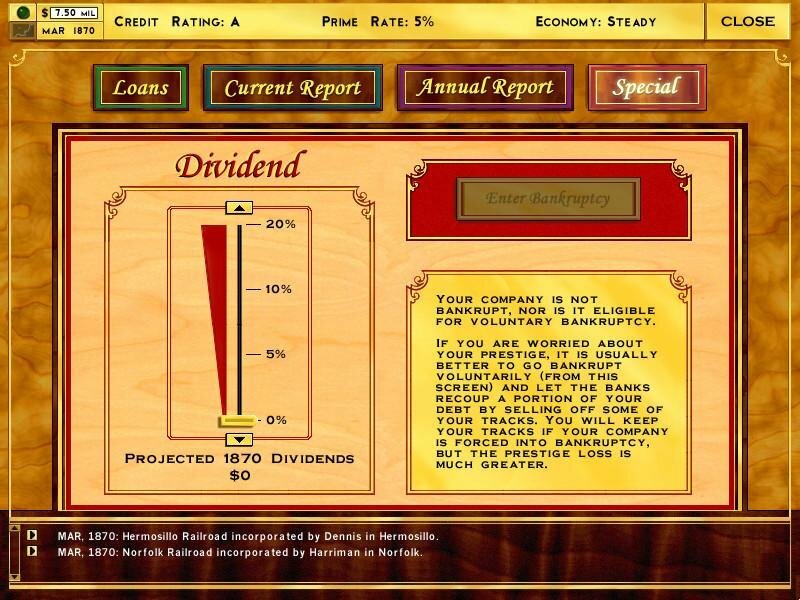 Whether we’re talking Panzer General, Civilization 2 or just about every strategic level sim from SSI, it seems that sacrificing superlative graphics is the hallmark of a deep, thorough economic, war or business simulation. So has developer Flying Lab approached the subject matter of trains from a strategic level. 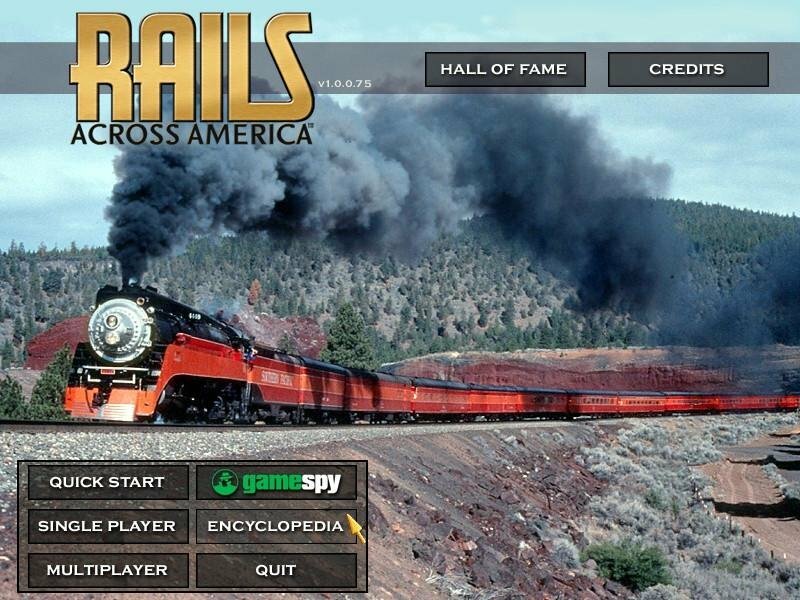 This means Rails Across America doesn’t offer that “all aboard!” thrill that you get from such games as Railroad Tycoon. 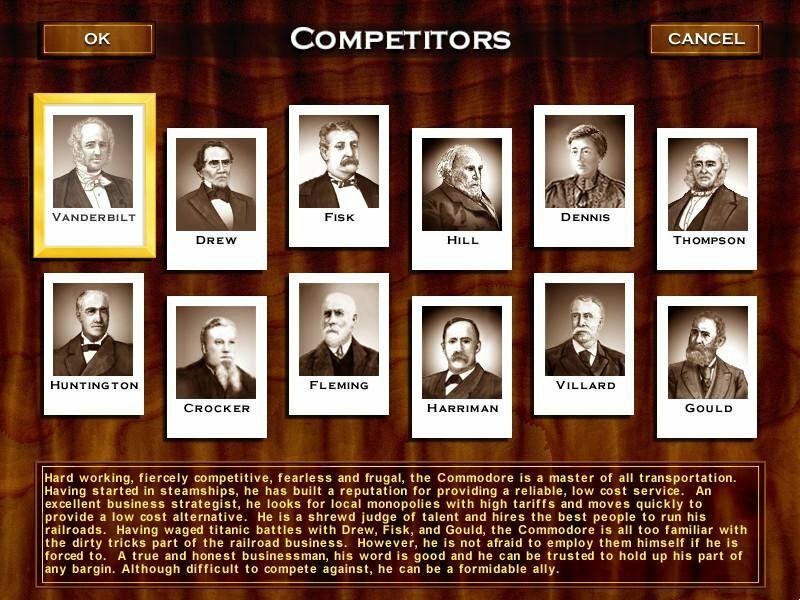 Instead of running trains, you run a railroad company. It sits at a higher, more abstract level than games about trains. The game board is a map of North America dotted with cities. 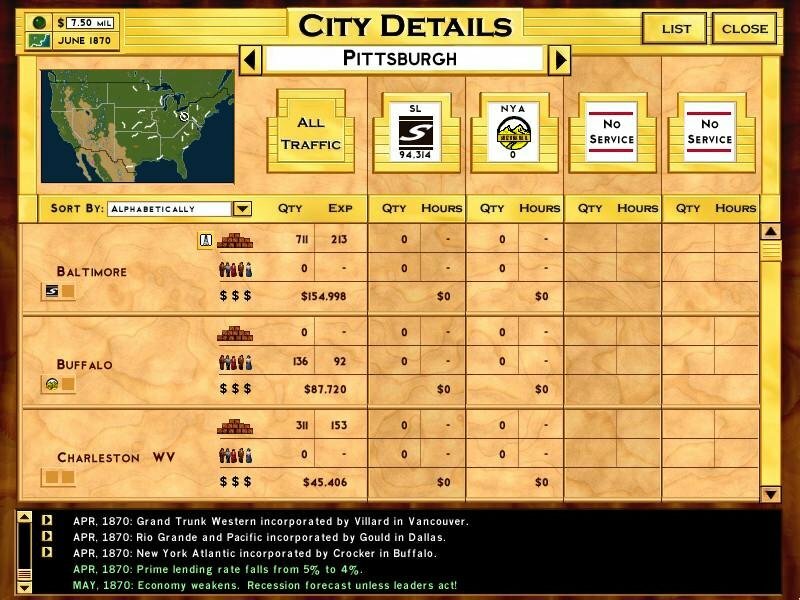 Each of these cities is full of cargo, champing at the bit to get somewhere else. New York might be brimming with stuff that wants to get to Boston, Richmond, or Milwaukee. 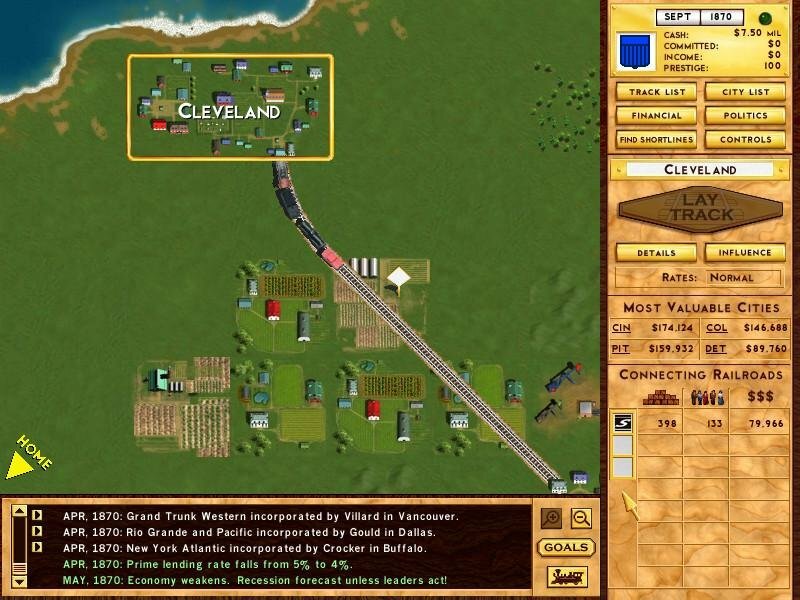 You build tracks between these cities and the goods essentially flow of their own accord, so you don’t get the micromanaging aspect of Rail Tycoon. Consider the map an elaborate network of stunted commerce – Your job is to lay in a means of circulating said stuff between cities. The trains themselves are incidental. Rails Across America is about the connections. The pace stays engaging because the game runs in adjustable real time and there’s almost always a choice of things to do. Scout for profitable routes? 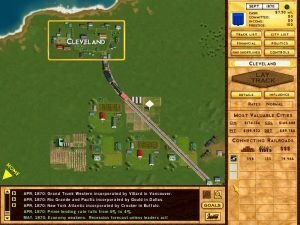 Upgrade tracks? See how your opponents are doing? Adjust traffic? 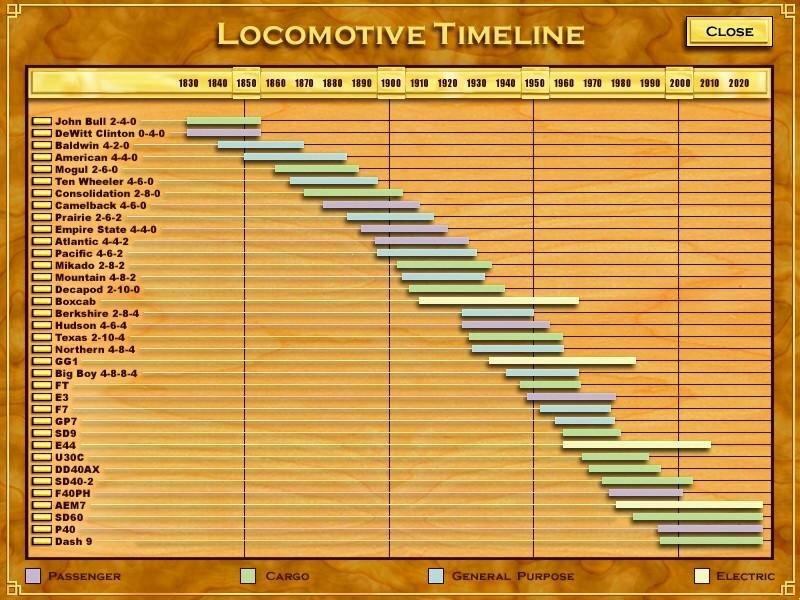 But the game manages the nearly miraculous feat of feeling intimate even in the late game when you’re in charge of hundreds of trains, dozens of tracks, and millions of dollars. Because the game is so clearly built for this level of play, it doesn’t bog down in micromanagement as you expand. You’re running a unified company, and you can have a sweeping effect with a few clicks. A brush with the paper manual is unavoidable, but the interface – once learned – is more than fair. 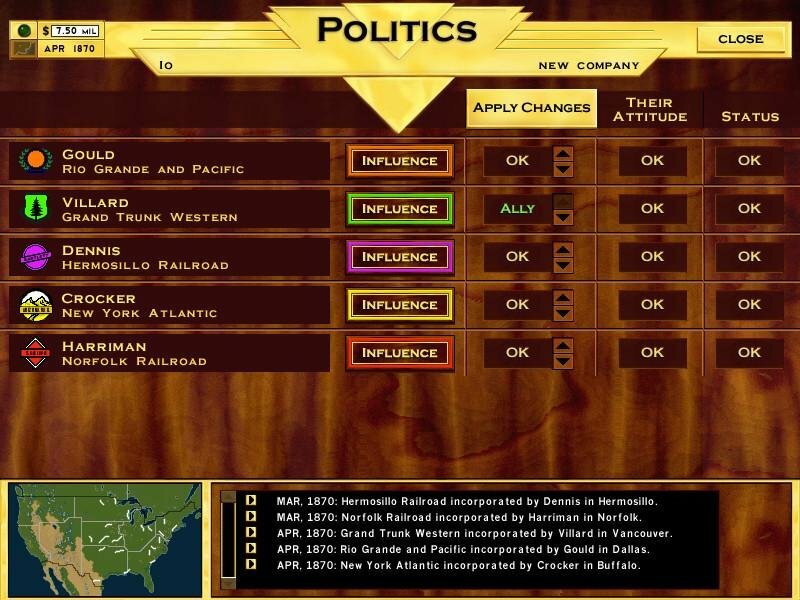 The standard games begin with early expansion followed by direct competition as you bump into other railroad companies. This competition is where the game takes a particularly clever turn. 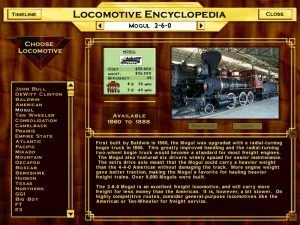 You’re scored by prestige, which is a factor of several different things: finances, quality of service, efficiency, geographic coverage, and bonuses for things like being part of the first transcontinental line. Money isn’t the bottom line (you can even go bankrupt and still win the game) and it isn’t your only weapon. 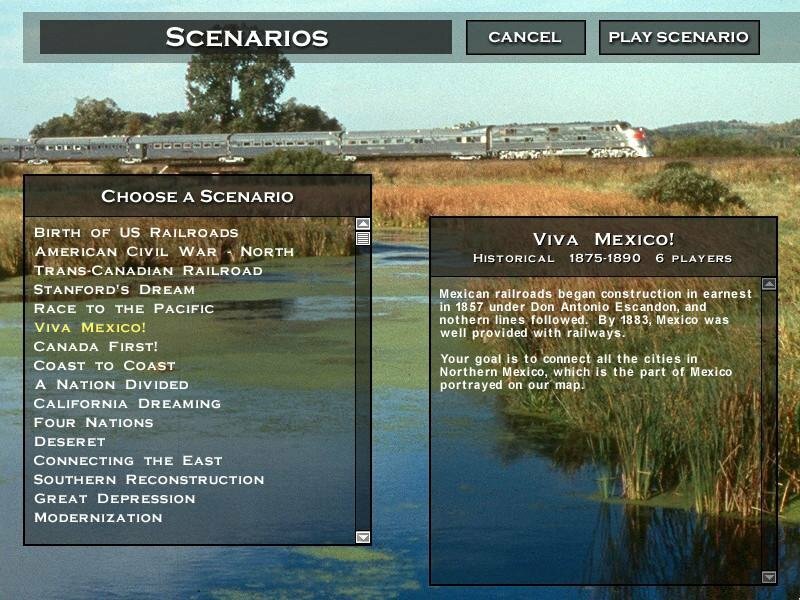 Like The Corporate Machine and Europa Universalis, Rails Across America defies easy categorization. 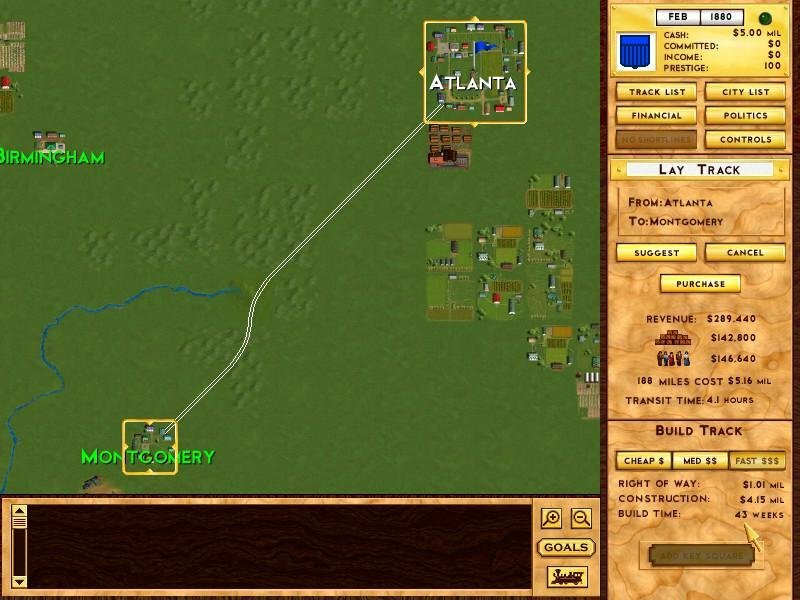 These are strategy games that run in real time. They are deep and complex, yet accessible and streamlined. They’re about building as well as competing. And, sadly, they all seem bound to be underappreciated and overlooked. 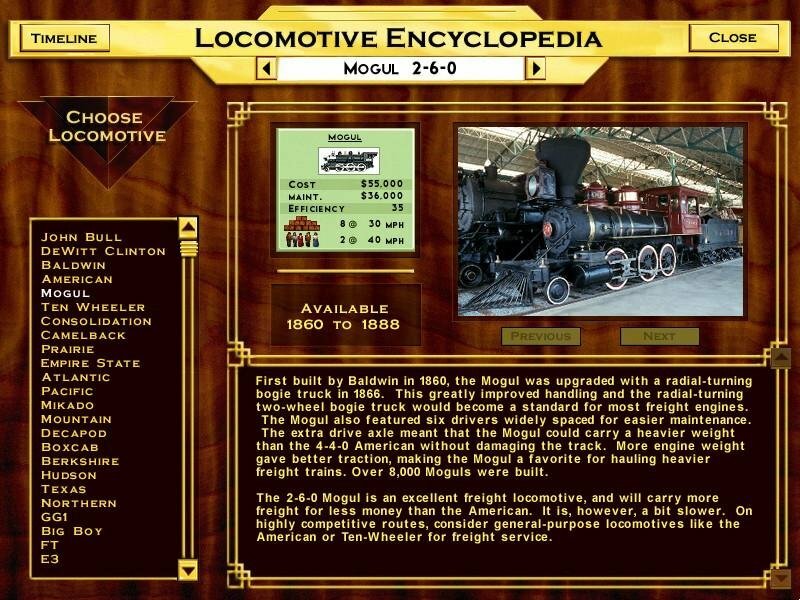 Of these games, Rails Across America has more polish, more personality, and more accessible subject matter. When strategy gaming breaks out of the established real-time or turn-based conventions, this is a great example of what you get.